Topps has announced all five of the 2014 Bowman Baseball Lucky Redemptions in one fell swoop. Collectors who get any of the product's Lucky Redemptions will receive a Kris Bryant Refractor Autograph. Check out the Lucky Redemption cards currently available on eBay. Bryant, the second pick in the 2013 draft, is a highly touted prospect with the Chicago Cubs. 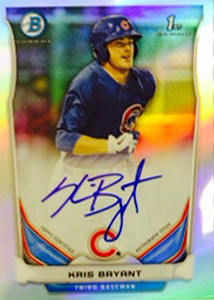 This isn't Bryant's only autograph in 2014 Bowman Baseball. He also appears in both the retail Prospect Autographs and Chrome Prospect Autographs sets. Prior to the announcement, Lucky Redemptions were trading on eBay for about $200-225. So does this mean that these will just be 5 sets of regular refractor autos #’ed to /500 or /100 each? Nick � From the way the release Topps sent out was worded, it sounded like there would be one card. Nick � That’s what I was thinking. I have to say….I think Topps dropped the ball with this approach. I pulled one and thought it would follow last year’s model….after all it bears the same “Lucky Redemption” name. Last year there were 5 different auto refractors #/100. This year….5 cards drawing out of an auto refractor #/500. The rarity has been traded for a sure hit of one of the top prospects. I don’t believe that translates proportionally. There are plenty of prospects that could have filled this out. As was mentioned names like Abreu, Bryant, Appel, Tanaka and Betts would have made for a great series. Oh well….it is Topps. They will do as they please. come on now, folks, let’s not be too much of a buzzkill here…OR…anyone want to buy my Lucky Redemption #4? Yeah, this announcement was a bit of a downer compared to last year. So far I have pulled a Lucky Redemption and a Mystery Redemption (Tribute), which I sold. I was hoping the Lucky might sneak in something cool like the Mystery 1 (Aaron in red ink, if I remember correctly–and mine was #2). I took a gamble and held on to the Lucky in hopes of a cool twist but instead have a #500 refractor. Oh well, I’ll keep the Bryant in hopes he leaves the Cubs as soon as he’s free-agent eligible and signs with a good team (go Cardinals!). Trinity is by far a superior product then Bowman. For all you who just cash in its sad. You’ve turned a hobby into spending mommy/daddy’s college money into a belief you should really get something special and sell it for $2k for a redemption. To many variants of too many players equals what y’all get! Trinity had 3 cards with everything being short prints! Needless to say I’m glad to own a patch(#/4), plus many other patches as well as almost all colors and other inscriptions. For what I paid for the patch (#/4), you could have bought 1 orange refractor that just sold for $2250! And theirs 21 less! Licensed or not, trinity is now the better product IMO. Heck, look at what the football cards look like! Their unreal. And grading these trinity cards and even the bowman and bowman chrome is a joke. It shouldn’t jack up the price by 5-10x like everyone thinks(per pricing on eBay)! The only cards that should be graded are pre-93 Derek Jeter SP Foils. It’s like authenticating autographs…those people are trained and look at examples. Sometimes players are in a rush, sometimes they sign better autos for players(look it up as their was an article in the NY Tymes or Business Journal)! Wish this went back to being a hobby and not just the people who can afford to break 100 cases buy them and rip people off on eBay or have people buy into breaks where hoarders get every card of one player! To. Bad those days are over! And he’s not going anywhere via free agency..theo will never let that happen. The Cubs have money to spend now that their owned by a group that will spend. And I’ve got Jaha game-used bats if your interested in adding them to your collection! How long does it normal take to get these redemption cards. Ive never gotten on until now. So I have no clue what to expect I just know it shows pending. Josh � Varies greatly. Sometimes very quick, others really long. Much of it depends on players’ willingness to sign in a timely manner. I agree with Blowmans. I mean, I do like the Bowman product, unlike that guy. I just agree with him that people who spend small fortunes buying a hundred cases, hoarding one player, then turning around and selling them on ebay for hundreds of dollars really makes the hobby a bit of a drag. Far too many people are sharks these days. I just enjoy busting a box here and there, seeing what I get, and joying looking at and touching and feeling the card itself. I enjoy the photography and the artwork that goes into them. Guess I am just more of a purist. I don’t like the intense competitive speculation going on.